Rico Royal reeds feature the traditional Rico cut with a stronger spine and a "French file". This construction allows for greater resonance and harmonics from the reed. The traditional French filed cut not only increases resonance, but also adds clarity to the tone and makes soft attacks easier. Royal reeds also particularly improve the response of the low register. 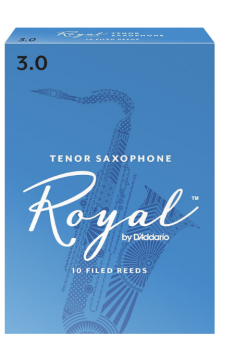 The construction of the Rico Royal reeds enables them to be used for both classical and jazz applications. Made with premium cane, Rico Royal reeds deliver consistent response for all players.